In my personal time I construct solid oak tables in Essex. My bespoke furniture products also include solid oak double beds. As a professional carpenter and joiner I enjoy the challenge of making my own bespoke solid oak furniture. Once ordered, all bespoke furniture can be collected from my home in Brentwood. I can personally deliver the furniture to you, but would have to charge £1.5 per mile (for round trip). All bespoke oak furniture is made from the finest green oak. My oak furniture products are made with care, sanded and finished to a high standard. This type of oak is very desirable due to its beautiful natural appearance, injecting style and elegance into any room. Each piece of hand crafted oak furniture has a unique grain pattern. Solid oak furniture lasts for years. Bespoke solid oak table made from high quality greenwood oak. Oak has always been seen as a superior wood, it offers great strength and natural aesthetics. 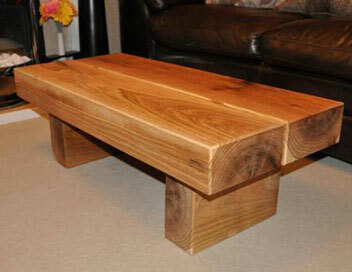 This oak coffee table is ideal for living rooms and bars. If you would like one of these oak tables please contact me with the dimensions you desire. Please feel free to ask questions. £200 for standard size. Price will vary due to dimensional changes or special requests. This bespoke solid oak bed is made from high quality greenwood oak. Oak has always been seen as a superior wood, it offers great strength and natural aesthetics. If you would like to buy a solid oak bed, please contact me. Please feel free to ask questions. 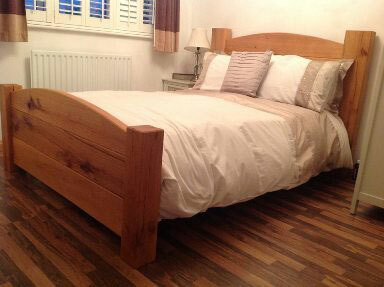 A standard double sized solid oak bed will cost £1000. Price will vary depending on design and dimensions.